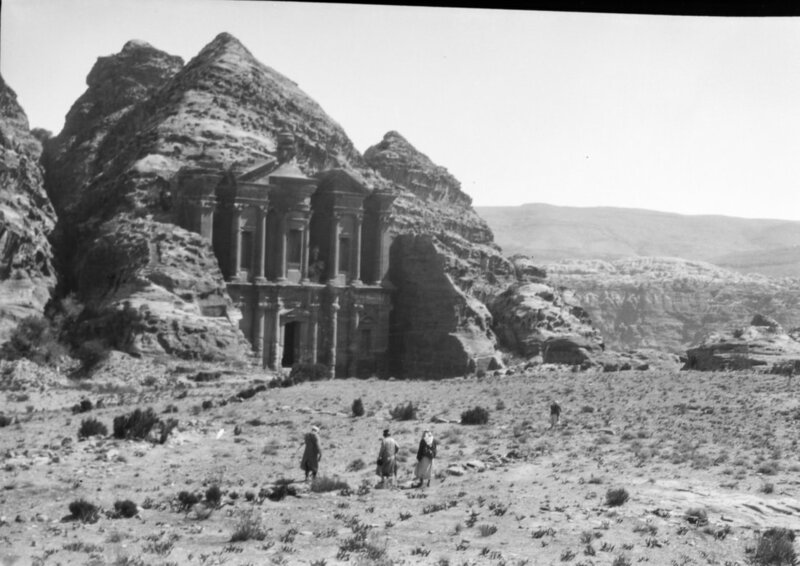 A list and brief descriptions of places mentioned in the 1929 Petra Excavation Fund Diary. Where possible, photographs have been put next to the descriptions. The photographs are labelled according to information given in the negative books or annotations on photographic prints in the Horsfield archive. Map of Petra with annotations by George Horsfield and Tawfiq Canaan, published in the Horsfield's final Petra publication in 1939. Copyright UCL Institute of Archaeology. The town where money to pay workers is obtained, and the railway station closest to Petra. A site on the road between Ma'an and Petra. 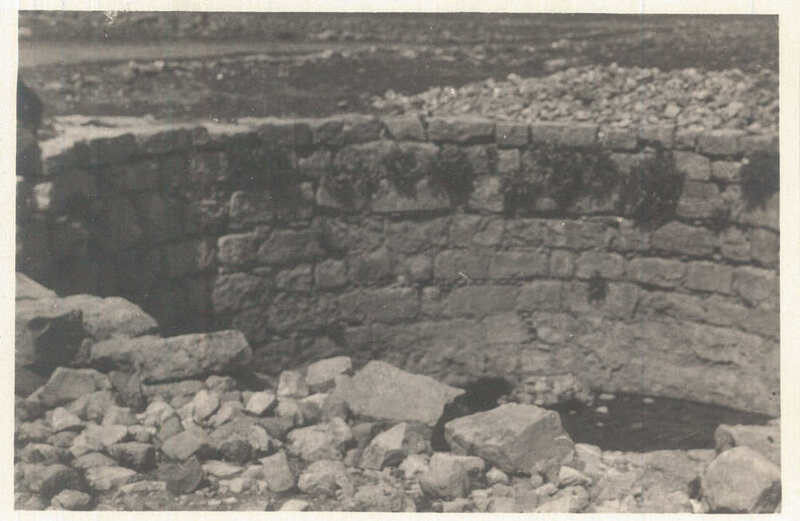 Photograph of a cistern at El Basta. Copyright UCL Institute of Archaeology. The small village closest to Petra, with surrounding orchards and fields, where a few supplies could be obtained. Villagers routinely acted as guides and guards for tourists. Tawfiq Canaan recruited some of his guides from Elji. An undated photograph in the Horsfield archive showing soldiers sitting in a street in Elji village. Copyright UCL Institute of Archaeology. 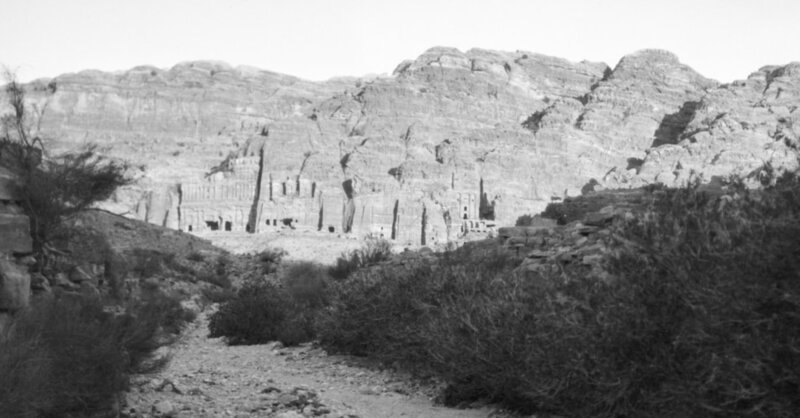 A site south of Petra, with Roman ruins. A Roman theatre in Sabra. Copyright UCL Institute of Archaeology. An area north of central Petra. 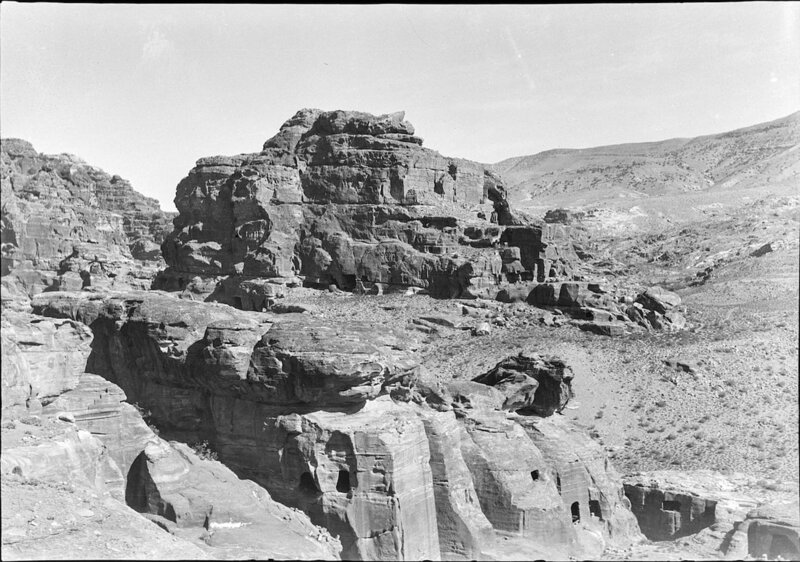 Siq al Barid Temple, El Barid, c. 1934-6. Copyright UCL Institute of Archaeology. The passageway into the centre of ancient Petra, formed by a tectonic split in the rock. ​​The Siq leads directly to El Khazneh (The Treasury). The Siq's narrow passageway, just as it opens to reveal El Khazneh (The Treasury), visible in the centre. Copyright UCL Institute of Archaeology. Tents and caves close to Qasr el Bint, where Thomas Cook & Son's tourists were accommodated. A white Cook's tent set up near El Habis, Petra, 1927. Copyright UCL Institute of Archaeology. ​A hill, close to the Qasr el Bint, where Ditlef Nielsen spends much of his time at the beginning of the excavation, looking at sancutaries. Excavation there in early May 1929. Also the site of a fortress from the Crusader period. Petra's "Old Museum" is there today. View of El Habis, taken from the West, 1934-36. Copyright UCL Institute of Archaeology. El Hubta/Khubta (El Khubtha) A mountain west of Er Ramla, and to the north of the centre of Petra's ancient city. At its base are the Royal Tombs. Royal Tombs visible at the base of El Khubta, Petra. Copyright UCL Institute of Archaeology. One of the Royal Tombs of Petra. The Tomb of the Urn, Petra, photographed in 2008. Copyright Amara Thornton. A mountain to the south of El Habis and west of the ancient city centre of Petra. Al Biyara towering over the Petra landscape. Copyright UCL Institute of Archaeology. A wadi to the south of Petra. A Wahabi caravan passes south by Wady Thugra in 1929. Copyright UCL Institute of Archaeology. A wadi running southeast-northwest, south of Wadi Farasa, crossing in front of Um al Biyara. View of the Siyagh. Copyright UCL Institute of Archaeology. First site of excavation, a column (survival of a Nabataean temple) close to the Qasr el Bint. 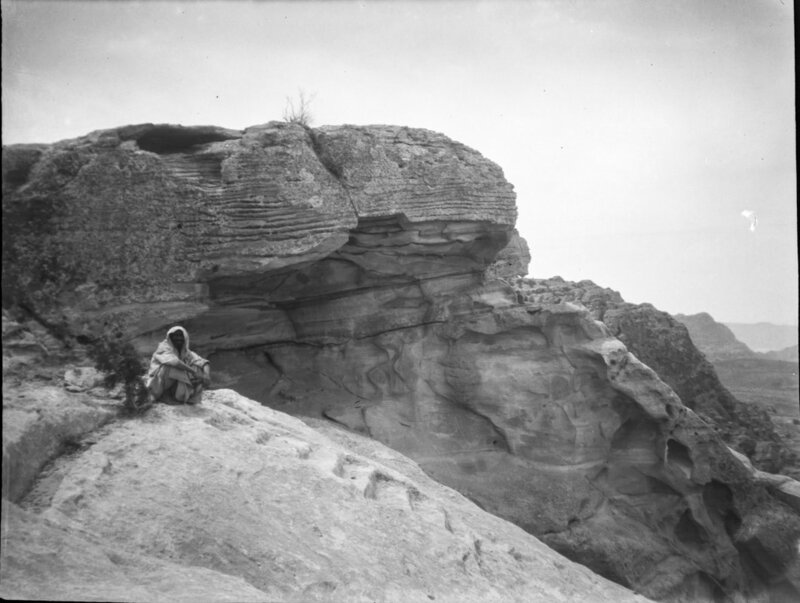 An unnamed individual sits atop Zubb Pharoon at Petra. Copyright of the UCL Institute of Archaeology. Detail of a portion of the High Place of Sacrifice on the summit of Zibb Autf. Copyright UCL Institute of Archaeology. 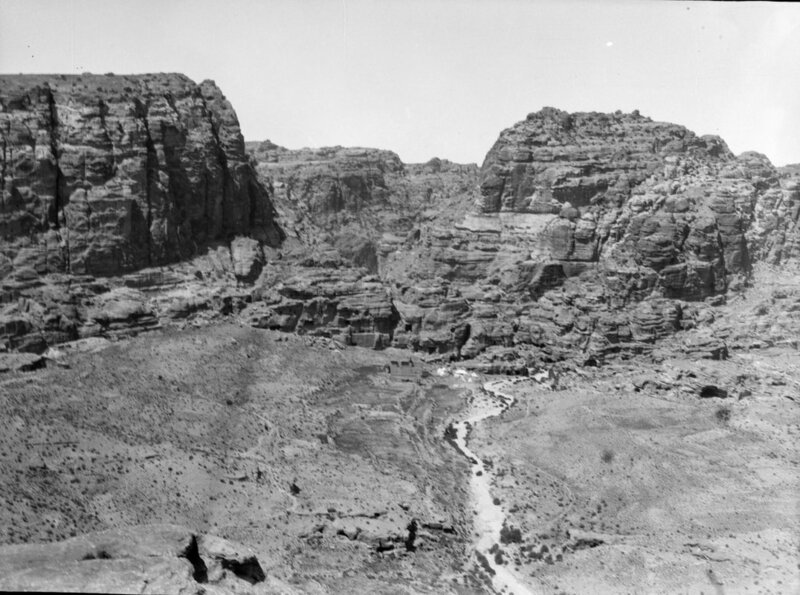 The north central ridge of Petra, between Wadi Turkmaniya and Wadi el Deir, including Wadi Ma'aisera el Sharkiyah and Ma'aisera el Gharbiyah. 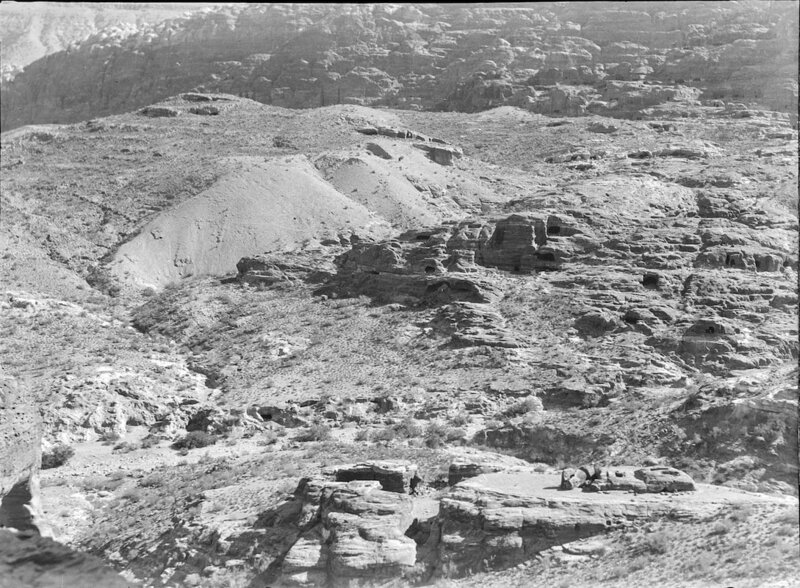 Excavation at Petra in mid-late April 1929 concentrated here. Now known as site of the Mu'aisireh tombs. View from El Khubta, showing Al Biyara (left) and El Ma'aisera (right). Copyright UCL Institute of Archaeology. A wadi running along the edge of El Khubtha, north of the Sextus Florentinus Tomb. View from the top of Al Biyara, showing the Ma'aisera (left) and the Wadi Turkmaniya (right). Copyright UCL Institute of Archaeology. On the east side of the Wadi Abu Ollega/Olleiquah (Ullayqa), on the Arqub el Hishe/Hishah (Arqub el-Htseh) en route to El Barid (Little Petra). A circle of large stones, interpreted as a retaining wall, surrounding a rock-altar, of great interest to Agnes Conway as a possible place of ritual/sacrifice. Excavated during the course of the dig, but nothing was found. Later named Conway High Place/Conway Tower. 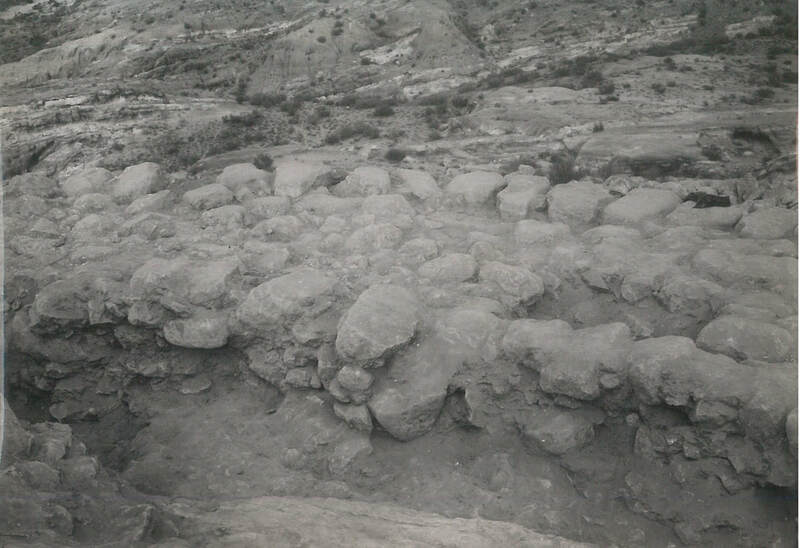 Part of the stone circle discovered by Agnes Conway in 1929, photographed during more intensive excavation on the site in 1934. Copyright UCL Institute of Archaeology. A mountain on the east side of the Wadi Abu Ollega. A mountain with one of Petra's most famous monuments at its summit. The 1929 excavation camp was located on the way up to the Deir. Al Deir (The Monastery), in 1927. Copyright UCL Institute of Archaeology. A tomb along the Wadi Turkmaniya which runs north-east of the city centre. 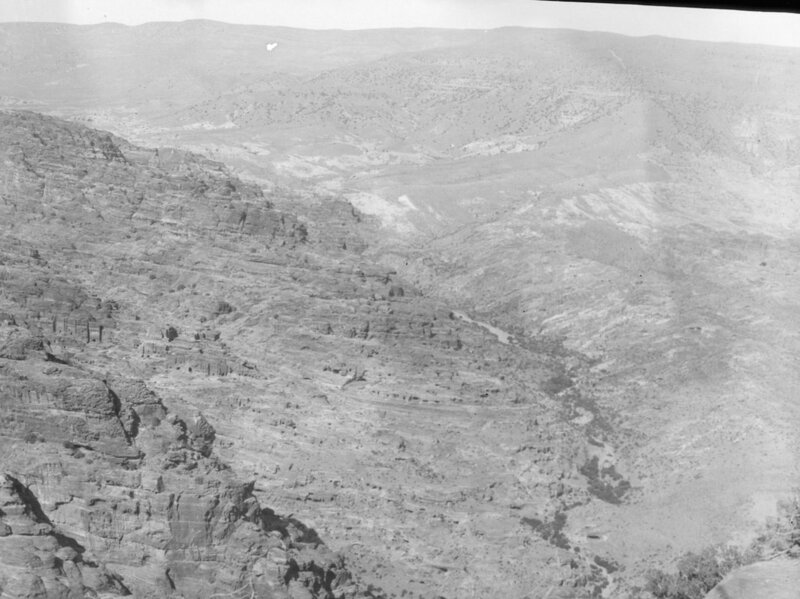 An unnamed man sits in this photograph from 1929, showing Wadi Farasa West. Copyright UCL Institute of Archaeology. A tomb on El Khubtha, like the Royal Tombs, but slightly to the north-west. A region to the west of the Siq Tunnel, in the Bab es Siq. A hill close to El Khasneh, east of Zibb Atuf. A photograph of the "Cave of the Christians" from 1927. Copyright UCL Institute of Archaeology. In the central part of Petra; excavation in the early part of the Petra dig (late March-early April) concentrates on this area. Between Wadi En Mer and Wadi Amm Rattam. 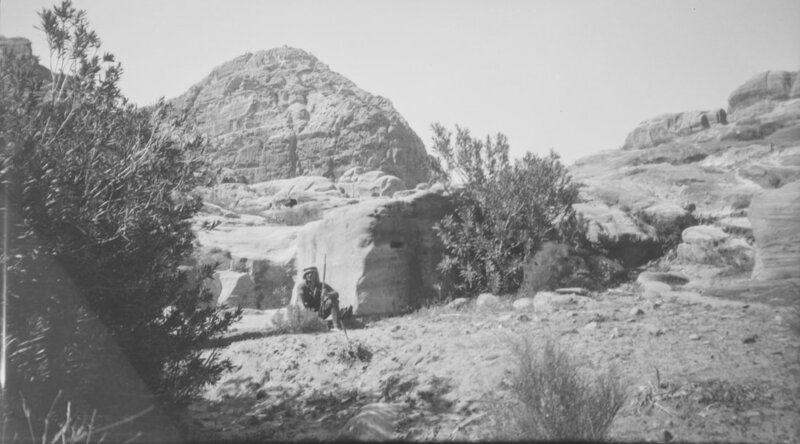 An unnamed man sitting by a cave on Jebel en Mer, photographed in 1929. Copyright UCL Institute of Archaeology. A wadi running Southeast from Wadi en Mer. A temple in the Wadi Farasa. The Garden Temple in the Wadi Farasa, photographed in 1927. Copyright UCL Institute of Archaeology. Wadi running north from opposite El Habis and hill adjacent. One of the Royal Tombs, carved into El Khubta, standing opposite the Theatre. Bordering Jebel ed Der on East and Siyagh in south. The Deir and Klausenschluct from the summit of El Biyara. Copyright UCL Institute of Archaeology. A tomb in the Ma'aisera, excavated in late April. A tunnel running east from the Siq, connecting to the Wadi Muslim. A site en route to El Barid. North of Petra, by El Barid. Part of an old trade route to sea coast at Gaza. A tomb east of Bab-es-Siq, now incorporated into the Petra Guest House hotel. A site in the area of Er Ramla.